We are happy to announce that we are hosting a launch for At Home: Talks with Canadian Artists about Place and Practice by Lezli Rubin-Kunda. Please join us at READ Books for a reading and light refreshments. In this intimate investigation of the artistic process, Lezli Rubin-Kunda explores the nuanced path of creative work and the way artists make sense of home and place within their art practice and their lives. Rubin-Kunda is a multidisciplinary artist who examines these issues in her own work. But in this book, she expands her horizons, travelling across Canada to talk to more than fifty practicing artists, including Amalie Atkins, Aganetha Dyck, Francois Morelli, Simon Frank, and Sharon Alward, about their work, their creative process, and the place of "home": in their work. What emerges from these thoughtful conversations are fascinating and unexpected orientations to place, ranging from deep connections to a specific childhood home, to more conscious adoptions of place, to somewhat fluid approaches in which the very concept of "home" seems to dissolve. Lezli Rubin-Kunda is a Canadian-Israeli multidisciplinary artist whose work explores her relationship with her environment. She has exhibited and performed in the United States, Canada, Israel, and Europe. She currently lives outside of Tel Aviv and teaches in the architecture faculty at the Technion University, Haifa, Israel. 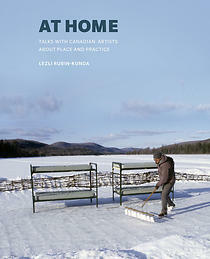 At Home: Talks with Canadian Artists about Place and Practice is published by Goose Lane Editions. READ Books respectfully acknowledges that this event takes place on the unceded, traditional and ancestral xʷməθkʷəy̓əm (Musqueam), Sḵwx̱wú7mesh Úxwumixw (Squamish), and səl̓ilw̓ətaʔɬ (Tsleil-Waututh) territories.